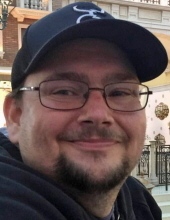 ANDERSON, IN- Randy A. Miller, 44, passed away on Friday, August 3, 2018 at Community Hospital in Anderson following a brief battle with brain cancer. He was born on September 29, 1973 to Wayne and Dixie Miller and lived in Anderson for most of his life. Randy was a wonderful man with a generous heart, brilliant mind and a God-loving soul. His wife Andrea was the love of his life and best friend. They enjoyed laughing together, watching their favorite TV shows, going to movies, traveling and spending time with their beloved Pomeranians, Daisy and Sophie. He enjoyed playing video games with his close friends Ryan and Bob, challenging others’ thinking, singing karaoke and constructing fireworks displays. Randy was a graduate of Madison Heights High School-Class of 1991. He also attended IVY Tech and Purdue University. He was owner and COO of JS3 Consulting, specializing in Medicaid Management. He was a member of the US Chess Federation. He had been a member of the Southside and the Madison Heights Chess Teams. Randy served as coach of the Highland High School Chess Team. He was an Indiana State Chess Champion and was a member of a National Chess Championship team. He was a member of the Leo G. White Demolay Chapter where he served as Master Counselor and Chaplain. Randy chaired NMEH, which was a national Medicaid Management Association. He was preceded in death by his parents, father-in-law Jim Ramsey and a brother-in-law-Rick Lattimore. Services honoring Randy’s life and legacy will take place at 1 pm on Thursday, August 9, 2018 in the Owens Funeral Home, 412 North Harrison Street, Alexandria with Pastor John Ray officiating. Interment will follow in Park View Cemetery in Alexandria. Friends may call at the Owens Funeral Home from 5 pm to 8 pm on Wednesday, August 8, 2018. To send flowers or a remembrance gift to the family of Randy A. Miller, please visit our Tribute Store. "Email Address" would like to share the life celebration of Randy A. Miller. Click on the "link" to go to share a favorite memory or leave a condolence message for the family.